BANDIPORA, OCTOBER 18: Government Higher Secondary School (GHSS) Bandipora today celebrated its annual day in which District Development Commissioner (DDC) Bandipora Dr Shahid Iqbal Choudhary was the chief guest. 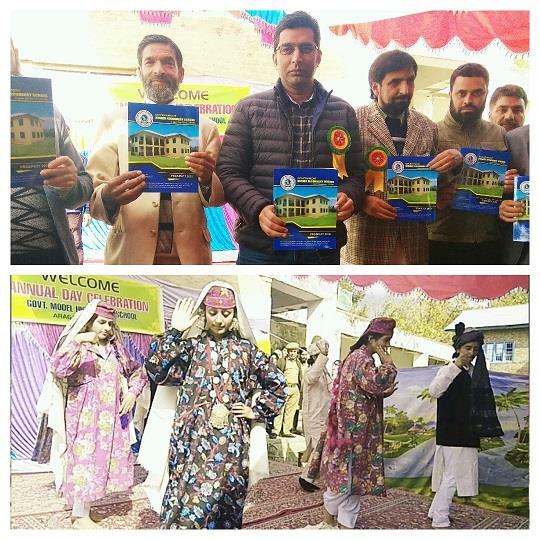 On the occasion, a variety of cultural programmes like Kashmiri songs, Gojri songs, qawali, Kashmiri folk dance and naats were presented by the students of the institution. The teachers and students spoke on various topics during the programme. The DDC while speaking on the occasion emphasised the role of education in empowering the citizens and the duty of the teacher community to imbibe value system among the students. He said teachers shape the career and future of students and should be honoured in all respects. He urged upon the students to develop positive and rational approach of thinking and cooperate with their teachers for the upliftment of the Nation. The DDC released the annual prospect of the institution and assured full support to the institution from the administration. The DDC also had an extensive discussion with the students and replied to various questions asked by the students about career building. During his address, Principal GHSS Abdul Rahim Khatana, highlighted the achievements made by the students on various fronts. Apart from school staff, a galaxy of intellectuals, educationists, writers, senior citizens, besides parents of the school children participated in the programme. Among others Tehsildar Bandipora, Tehsildar Bandipora and ZEO Bandipora also attended the programme.